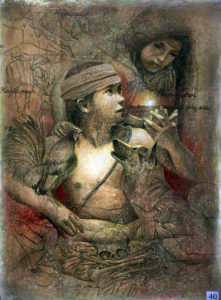 LAM-ANG is the hero of one of the most popular Philippine folk epics, Biag ni Lam-ang (Life of Lam-Ang). The Biag ni Lam-ang, from the people of the northern Philippines, is said to be the only complete epic from a Chris­tianized Philippine indigenous group. Exhibiting a mixture of Spanish and indigenous cultures, the earliest written record of the epic was in 1889. There are at least ten versions of the epic. Namongan gives birth to a baby with incredible strength and courage, named Lam-ang. The boy asks his mother about his father’s whereabouts and learns that he has gone to fight the Igorot. Lam-ang arms himself with charms and decides to look for his father. From a dream, he learns that his father, Don Juan Panganiban, had been killed by the Igorot. Later, Lam-ang finds the Igorot in a sagang, a feast celebrating a successful head­hunting expedition. His father’s head is dis­played in the feast. Lam-ang slays them all with his spear and mutilates the last among them. When Lam-ang returns home, 99 maidens wash his hair in the river. For his shampoo, he burns so many rice straw that the communities near the river are alarmed by the smoke. The dirt from his hair kills all the fishes in the river. He then kills a croco­dile and carries it on his shoulder ashore amidst the applause of his companions. Lam-ang hears about a beautiful maid­en named Ines Cannoyan, the daughter of the richest man in the town of Kalanutian. He tells his mother of his desire to court the maiden. Although his mother discourages him, he goes anyway, dressed in gold and accompanied by his pet rooster and white dog. The giant Sumarang blocks his way and belittles him. Lam-ang defeats him in a duel and hurls him nine hills away. Later, Sarindadan tries to seduce him but Lam-ang rejects her advances. Reaching Kalanutian, he im­presses Ines with his magic. His rooster crows and topples a small outhouse. His dog barks and the outhouse is rebuilt. Ines invites him to the house where the rooster acts as Lam-ang’s spokesperson. Ines’ parents ask for a bride price, which Lam-ang agrees to give. Lam-ang returns home to prepare for the wedding and the presents. He and his townsfolk sail on two golden ships to Kalanutian where Lam-ang and Ines have a Catholic wedding. The townspeople board the two ships to Nalbuan, Lam-ang’s birthplace, to continue the celebration. After the celebration, Lam-ang agrees to hunt rarang, a shellfish. He is swallowed by a giant fish, called berkakang, as he has dreamt so. However, a diver recovers his bones. The pet rooster flaps its wings and resurrects Lam-ang. He then rewards the diver and lives happily with his wife and pets.